The Simple Download Monitor Plugin gives you the ability to display the latest downloads you have created on a post or page. A simple shortcode allows you to dictate how many of your latest downloads you would like to display to your visitors. For example, you may always wish to show your ‘5’ most recent downloads on a page titled ‘Newest Downloads Available’. Using the ‘Latest Downloads Shortcode‘ on a WordPress post or page means that the most recent downloads will always be displayed automatically. The ‘Latest Downloads’ shortcode was used in the example below to display ‘2’ of the newest downloads available on the website. Step 1) Ensure you have a number of items in your ‘Downloads’ inventory. Step 2) Create a post or page from your WP dashboard. Step 3) Copy and paste the following shortcode into the text editor of your page. 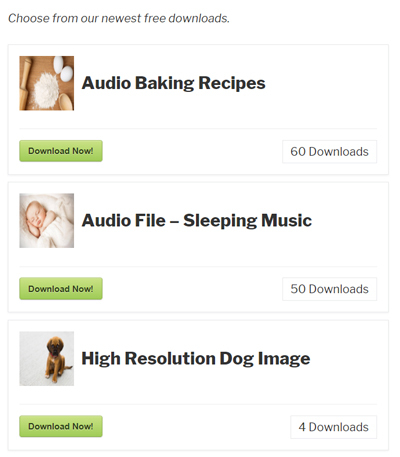 The above shortcode will display 5 of your latest downloads using the fancy 1 display template. You can use any numeric value for the “number” parameter to adjust how many of your latest downloads you wish to show your visitors. Step 4) Replace the ‘downloads number‘ to the number of recent downloads you wish to display. Step 5) ‘Publish‘ your page. The shortcode above is used to show all of the latest downloads not dependant on which category they were placed in. Adding an extra parameter to the shortcode enables you to show the latest downloads specific to a certain category. 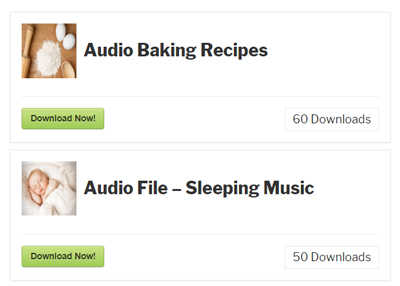 The above shortcode will display 5 of your latest downloads from the ‘audio-downloads’ category using the fancy 1 display template. You can use any numeric value for the “number” parameter and specify any download categories in the ‘category_slug’ parameter. Using this shortcode will display a specific number of your latest downloads from a certain category. Step 5) Replace the ‘category_slug’ text to the category slug that you wish to display. Ensure the category is spelt correctly. 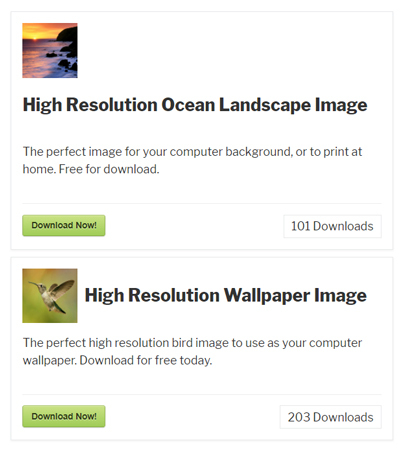 In the example below, the ‘Latest Category Download’ shortcode was used to display ‘2’ of the latest downloads from the ‘Wallpaper’ category.